I had a difficult time sleeping all night long, and woke up to find an overcast morning. I felt I was suffering from a low-grade fever. I got out of bed quietly so that Heidi would not notice and confirmed it with a thermometer. It indicated that I had a fever slightly above 100 degrees F as I speculated. There were 5 days left to the end of this scheduled trip. As long as I can tolerate my condition for the remaining days without any catastrophe, I would be satisfied with our discoveries. This gave me dramatic determination to keep persevering onward. Now, I understood why my encounter was so strange at Babi Yar. The spiritual visions were obviously caused by a virus I might have contracted some time before we left for the trip. Since the incubation period can last two weeks, it is feasible that I was now feeling the effects of the virus. I hoped at least this would be a common cold without the company of a high fever. 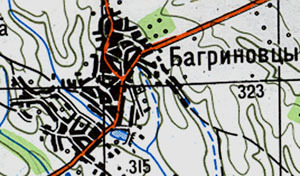 The distance from Vinnitsa to Litin is 36 kilometers. The distance from Litin to Bagrinovitsy is 16 kilometers. We made it to Bagrinovtsy by ten O’clock in the morning since we left hotel rather early in the morning, as planned. Our plan today is to explore this village the entire day. On the way here, we were met with a view of an unpaved road lined with trees (see picture above). A herd of slowly walking cattle covered the state road. Cows are the major domestic animal in Podolia and Poland. Westward from Litin to Bagrinovitsy at the northwest entrance, we met an old paved road, which looked as though it continued endlessly into the horizon. Entering the village, we met again a road full of cattle. A couple of shepherds followed the animals with a call that sounded like “Donna”. “Donna.” This was recorded in my mind from a Yiddish song made popular by Joan Baez, “Dona”. The song originated in Podolia composed by Shalom Secunda with lyrics by Aaron Zeitlin. I thoroughly enjoyed the image as described in the song of swallows gliding over a herd of cows. We entered the village from the same east entrance as when Sasha accompanied us last Saturday. The familiar road met another road that ran from south to north. At the intersection where the two roads met, we stopped the car to explore. There was a grocery store with a little dining room standing directly in front of us where we walked in and shopped for some lunchmeat for the sandwiches. On our right, stood the shelter for the bus stop and on our left laid a memorial park. It appeared that we were at the central areas of the village. On the other side of the three-way road intersection, I saw a Russian Orthodox cemetery. A portrait of a military man was displayed behind a large artificial flower bouquet. While Heidi and Vlad were shopping at the market, I walked along toward the southern exit. On my left I noticed a sign of the state office in a building, which resembled a ranch house typically found in the US. It must be an administrative office for the village. I measured the distance from this intersection to the south end of the village and it was approximately 10 minutes on foot. Returning to our very conspicuous car, we cruised northwards until we reached the end of the village. It was quite a distance. For a population of 2000, it appeared spacious. At the north end, we enjoyed a panoramic open view of the horizon, a sea of one gigantic grass field. I needed to collect some information about the village and therefore returned to the central area of the village to visit the state administrative office. Vlad offered to secure an introduction first, yet it took him so long to return to us – I worried. Finally he revealed himself, and told us there was a huge detail map of the village displayed inside. I grabbed my camera and Heidi, and walked into the building. A state officer met us in a most unfriendly manner inside his office. We tried to talk to him about the village unsuccessfully – he feigned utter ignorance. He reminded me of the initial treatment we experienced at the archive office in Vinnitsa. He kept answering our questions with, “I do not know”. How can a man involved in the running of a community know absolutely nothing – it seemed ludicrous to us. We had no choice but to take in the detail of the local map with our cameras – and only that. I believe I saw a sheriff in uniform walking along the office corridor. According to a report by the Deputy Director of Archives in Vinnitsa, a large group of Gypsies moved into this village. Unfortunately for us, we could not distinguish between the Gypsies and the local farmers. We knew that we, as foreigners, especially an Asian like me, appeared to be a novelty. We perceived that we already were big news among the villagers; those who came out of their houses often greeted us. However, we never felt unwelcome. The villagers were courteous, friendly and well mannered. We returned to the north entrance of the village, stepped out of car and enjoyed the great panoramic view of the horizon. Heidi and I even enjoyed a short but significant conversation about Ukrainian real estate: a conversation covering how we would manage the life as a cattle breeder or gardener in this village as we entered retirement. The beauty of this land had such a strong impact on us. The air was so fresh and clean unlike California, free from the fragrance of smog. Although there were signs of a summer storm with the warm and humid atmosphere, we enjoyed the tranquility of a dream-filled moment. This may be a bad habit of mine to fantasize such a moment as this. And yet, I could not help toying with the idea of purchasing land while sitting and looking at the sea of green field. I sensed Heidi shared the same dream if only the situation would allow us to do so. She never told me so but it was my guess, as her husband of twenty years long. Even if she asked me my opinion, I would not object - the idea was not that bad. As for a mathematical point of view, it would build up to be a fortune in a couple of decades if we could buy some decent size of land, for now the cost is half of what it would cost in the US. It is all contingent upon the political environment and the government. The term for the President Kuchma is about to end and therefore it depends on who will be his successor of power. Anyone who reforms the republic from the old Soviet regime would enable all our dreams. But changing the Ukraine back into the Soviet system would destroy them. A landowner would have numerous obstacles under these circumstances. We could hire a dozen of medical interns in California and send them here to this village for two years. At the same time, the village manager would build a medical clinic and organize a self-administrated community. We can build an electric power source and water supply including sewage treatment. Villagers would be able to concentrate on their farming and it may be possible to see this venture come to maturity within ten years. It has been a wild daydream I have dreamed. The fantasy of owning this beautiful land of black soil is the very temptation of past invaders who could not resist otherwise. Thankfully, I do not have the power or the money to carry through with my dream. We intend to visit this village within the next three days. We now have to go into Zaluzhnoe at this time. About one kilometer out of the village, we saw the back of a uniformed sheriff walking along the road. Vlad stopped the car and we asked him where he was going. The sheriff said he returning to Litin where he lives. Although we were bound for Zaluzhnoe, we offered to take him up the state road to Litin. He accepted our offer. I could not help thinking about a government official’s life in Podolia. A State officer was commuting on foot for a two hours long trip every day. I, on t he other hand, also have a two hour commute everyday – by car. I am convinced. Vlad is right. Ukraine still maintains life, as it was one hundred years back. We entered Zaluzhnoe from the front entrance. At first, we walked around the remains of the old factory. They say the land belonged to the state and no individual can own the local land. This policy may change sooner or later. It is obvious that news of our presence spread through the village. All the passers-by stopped and greeted us as if we were their decades long associates. It was now the times for me to act like a Santa Claus. My guardedness was relaxed and I started distributing “Camels”. Halleluiah, they are accepting of my offer. We had their approval! A thought passed through my mind that an act of offering a gift is not for the receiver of that gift. But it was for “offerer” to be recognized! We went deep into the village by car until the road turned to gravel and overgrown with weeds. We thought this an ample place for a picnic. At the foot of the hill we encountered Igor, a shepherd who managed twelve heads of cattle. He was the one who had assisted us earlier when we asked where the road at the bottom of the hill lead. We sat in the meadow next to him and listened to his life story. He told us he was thirty years old and was married. He lived with his wife and her mother. I pointed towards the herd of cattle grazing peacefully and asked him if they belonged to him. He said no. He told us he owned two while the others belonged to his neighbors. It is his job to walk the animals to better grazing throughout the day. Recalling my own dream, I asked him whether he had any dreams he could share to give us a better idea of the life in this village. To my surprise, he replied eagerly. He said the village once had a great Polish landlord. However, after the revolution, the landlords were forced to return to Poland. Igor told us he wished the ‘pan’ could return so that the old day administration could be reinstalled. This reminded me of the play “Waiting for Godot,” written by Samuel Becket. It is the story of two men waiting endlessly for “Godot” who is likely to appear at any moment. The Polish landowners were the ghosts of 100 years old. I wondered how Lenin would have perceived this if he found out that his Bolshevik revolution intended to put the power in the hands of peasants, had failed to such an extent that the peasants longed for the days of being lead by the landlord. What surprised me was how Igor did not aspire to governing himself. The present peasants wished for a leader who had good senses of politics. That means this area is ripe for such a dreamer, like me, to be accepted; to fulfill his dream to create a little utopian kingdom. In the past 600 years, Ukraine has frequently fallen victim to invaders. They, too, had a dream just like myself and in fulfilling their dream, they ruined this land. I felt a chill down my back. I cannot be an exception from the greed. Whoever stood upon this land must have feverishly fallen in love with its beauty and richness. Can land seduce people to such a degree, compelling them to own Mother Nature? After all it was the spell of the land that spoiled the minds of the people! I kept thinking for a while until sunset. Igor said good night for the time had come for him to return the cattle back to the owners. When we went back to our car, we found Illya waiting for us. He said his wife, Maria, wanted to invite us for the dinner. We accepted. It looked a little farmhouse from outside but once we were ushered inside, we could see the house had many neatly decorated rooms. Illya was the most senior villager in Zaluzhnoe who told us the story of the alcohol factory fire. Their two grown daughters lived in Kiev. Our host told us a story of the village proceeding to the 1941 Nazi invasion. Nazis had taken Illya to Berlin as a forced laborer. He served for two years in the camp before returning to the village. We were served with a sweet wine made of fermented cherries called Kompost. Vlad told us this wine was usually reserved for guests. We were also served Kielbasa sausages were popular among many Slavic families. Heidi and I were especially fond of the sausages. Maria made the sausages herself and preserved them in a large jar – which she emptied into a frying pan resting on top of a small portable grill beside the table on which we ate. We loved the taste of the fresh Kielbasa. When the time came to say good-bye, Maria wanted Heidi to follow her to their garden in the back of the house where she grew rows of potatoes. She started to dig up some of potatoes and wanted Heidi to take them as souvenirs. Heidi stood by Maria in the field with an armful of potatoes and enjoyed the momentary smell of the rich black soil. It had been a wonderful evening visiting the local Zaluzhnoe people giving me a glimpse of Ukrainian farming life. I never dreamed I would ever experience such a day. They even wanted us stay over night in their home. But we had to say good night for the day; we had another busy day waiting for us tomorrow. We arrived at the hotel at 8 O’clock in the evening.